This is where one of the greatest collections of roses exists. 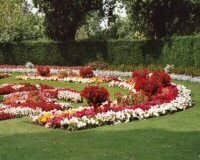 Description: Queen Mary's Rose Garden in Regent's Park is one of the greatest formal rose gardens, with more than 60,000 plants in radiating beds or scrambling along ropes in Fragonard swags. It was added in 1828, with the London Zoo, and were originally called the gardens of the Royal Botanic Society.